A compelling WWII story, laced with suspense and drama United States Army Air Corps Lieutenant Eugene T. Winn wrote home to his father regularly, from before his enlistment in May 1942 until his discharge in September 1945. This correspondence is the core of the book. Documents and photographs give a definitive sense of place and immediacy to the story. And in the telling, the reader can learn much of war and its lasting effects on persons, family, community. It is a compelling story laced with suspense and drama. Lt. Winn did not want to be in the Army, and like many young men of his day saw aviation as preferable. The airplane was going to revolutionize war making. Eugene wanted to be part of that revolution. 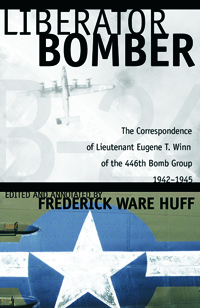 And so he was, in a four-engine bomber, a B-24 "Liberator," stationed in Bungay, England. In early June 1944, Winn's wife was notified that her husband was "missing in action." Frantic attempts to find out what had happened on 25 May 1944 had to wait the liberation of Paris for answers. No fairy tale this, still a happy ending, but with scars and lessons for a lifetime. The story indeed is compelling, more compelling than any fairy tale might ever be.